Some things are uniquely Singaporean. Like your lahs and your lehs. 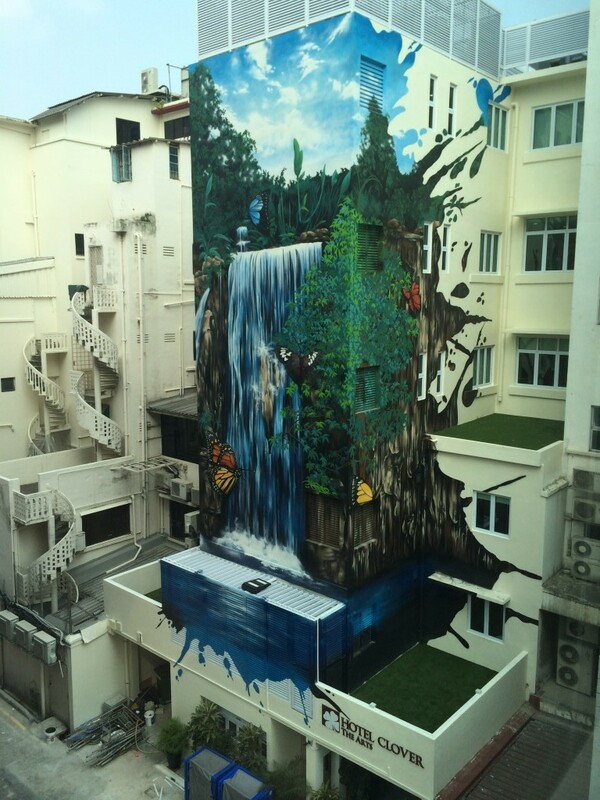 Another thing you’ll find that’s different in Singapore are the boutique hotels. Overseas, cost-conscious Singaporeans go for boutique hotels that are no frills, have simple pantone coloured walls with all the basic necessities down pat. It’s different in Singapore. Boutique hotels are often of comparable pricing as that of established hotel chains. Reason being that they simply offer that fresh novelty, surprise and that special something that typical hotels do not have. In Singapore, well known boutique hotels include Wanderlust, Wangz and New Majestic Hotel. 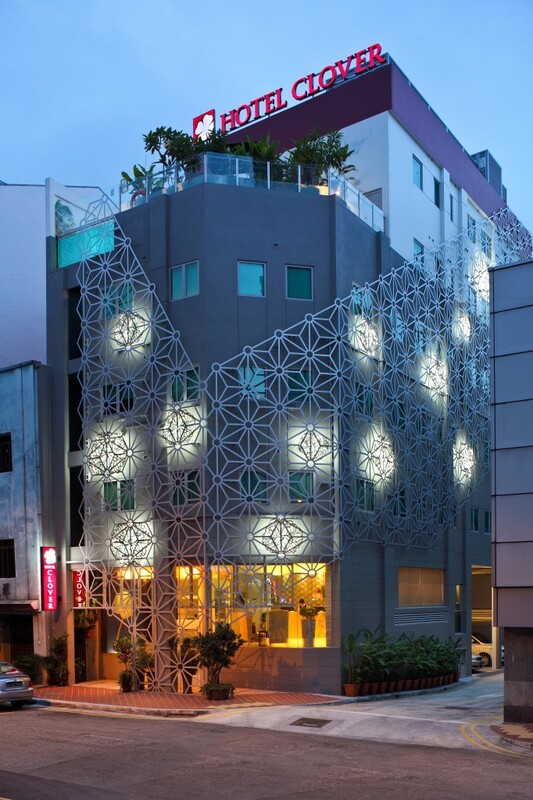 New kid on the block Hotel Clover 5 Hong Kong Street is the latest to join the boutique hotel craze in Singapore. Founded in 2013 and aiming to be a premier boutique hotel, the 6 storey hotel at its namesake, 5 Hong Kong Street is a business style boutique hotel that is located a stone’s throw away from Chinatown area for both business and leisure travellers. Welcomed by its signature lush and mossy vertical green walls and latticed frame, we stepped into a little piece of sanctuary hidden between shophouses. In fact, blink and you may almost miss it – which is the reason why we value the underrated subtlety it provides. What’s great is its location. To those who say that you can’t have your cake and eat it, Hotel Clover 5 Hong Kong Street proves otherwise. It provides the getaway that’s obscured from the public eye and the ultimate urban getaway, but is also conveniently located near MRTs, business and shopping districts and popular night spots. You’ll also find hip brunch places and speakeasy bars along the same street! We showcase a few of Hotel Clover 5 Hong Kong Street’s signature facilities that thrills vacay and staycay goers alike. Surrounded by hand painted flora and fauna on the walls and lush vertical walls, pool loungers and swimmers will feel like they’re swimming in the rainforest. Also, as Hotel Clover 5 Hong Kong Street is situated between shophouses, it remains relatively hidden from sight. You can enjoy experiencing the suprerb views of the CBD skyline yet retain your privacy. Our only qualm was that the pool was relatively small. Also, there are only two lounge chairs. When viewing the pool, the chairs were already occupied. We were also unfortunate to experience the hazy period during the staycay and did not try out the pool. Roof top pools are still that special something to most people and we would be sure to try this out the next time! Hotel Clover 5 Hong Kong Street offers 55 rooms: 24 Superior, 12 Deluxe, 14 Executive and 5 Premier Executive. What we liked about the rooms were that they had contemporary touches with floral murals to soften the otherwise boutique business hotel that it is. The rooms are all equipped with fluffy white sheets, free WiFi, full bathroom amenities (with the option of a Rain Shower!! ), a flat screen TV mounted on the wall and all other amenities that one necessarily needs in a hotel. Also, because of its location, you are assured of a good night’s sleep with not too much noise or disturbance. The only comment one would make would be that of the size of the room. Slightly reminiscent of hotels in Hong Kong, the room size was small and once the door was opened, it very nearly touched the bed. It is only fair to state that Hotel Clover is a boutique hotel and aims to provide comfort at reasonable prices without forgoing the amenities. We are proponents of good service so the fruit platter perched upon the vanity table was a good start. Upon a test of responsiveness by way of calls to the main desk and housekeeping lines for WiFi requests and extra amenities (extra pillows! ), the service staff were courteous, friendly and most importantly, prompt. Breakfast was served at the ground floor that had a seating capacity of around 30 people. Do not expect too much from the breakfast selection, but the basic choices of cereal, toast, eggs are provided. What’s special about the Hotel Clover chain? The novelty in the chain of hotels from Hotel Clover lie in transforming old shophouses into boutique hotels nestled in locations that are rich in heritage and culture. Besides Hotel Clover 5 Hong Kong Street, the other two hotels include Hotel Clover 769 North Bridge (an eclectic vintage themed hotel in the heart of Kampong Glam) and the up-and-coming Hotel Clover The Arts (located just behind Hotel Clover 5 Hong Kong Street at 58 South Bridge Road with 44 uniquely designed rooms and a graffiti mural adorning its exterior). Be it business-centric or vintage preferences, guests are sure to have a variety of choices provided by Hotel Clover. Thank you for the invitation, Hotel Clover 5 HongKong Street.